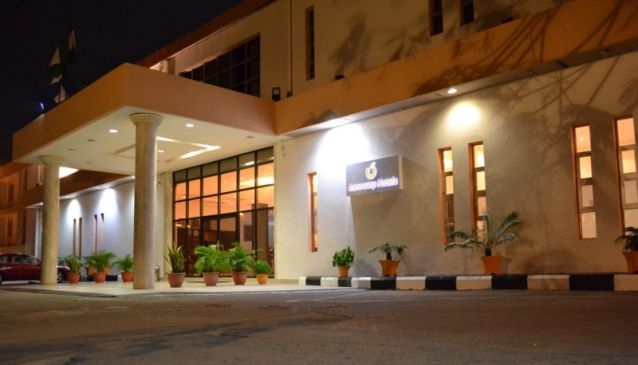 Transcorp Calabar is one of the top hotels in Calabar to enjoy all round luxury, comfort and beauty on your stay in Calabar. The environment is safe, the hotel grounds are big and allow for adequate parking space. The Lobby is beautiful and someone attends to you as soon as you arrive. Book a room from their five room types, they have the Ambassador Suite, Executive Suite, Pool Side Chalet, Royal Suite, Standard Room, Standard Twin Room. The rooms are well designed, decorated and cater to all your comfort. You get access to 24 hour room service, a swimming pool, gym and fitness center, conference hall for your events, meetings and shows. The restaurant boasts of various dishes from the local Nigerian cuisines to Chinese, Spanish, and other continental dishes. The bar caters to your thirst serving you delightful cocktails and cool refreshments.